Either you know a Cynthia or you’ve been one! Cynthia is that smart, sweet but easily influenced girl, who is desperate to feel among. She’d like to believe that she is a full member of Diana’s squad, but the truth is that Diana hasn’t fully accepted her and she keeps Cynthia on the side-lines constantly testing her and putting her down. Cynthia has a secret crush on one of her classmates who clearly does not feel the same way (at least not yet), when Diana catches wind of this she mocks her mercilessly and threatens to expose her feelings. When an awful incident occurs Cynthia sees an opportunity to break free from Diana. Will she take it? 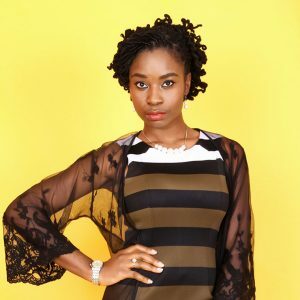 Uzoamaka Aniunoh is an actor and qualified writer who made her debut earlier in 2017 when she starred in a web series called ‘Skinny Girl in Transit’. Although she has spent much of her life writing, she has proven that she has the credentials to cut it as an actress. Expect her to bring something a little different to MTV Shuga Season 6 where she will be playing the role of Cynthia.